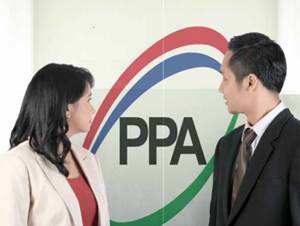 PT Perusahaan Pengelola Aset (Persero) - PPA is a reputable state-owned asset management company in Indonesia. The Company engaged in investment, restructuring, advisory and financing. PT Perusahaan Pengelola Aset (Persero) was established on 27 February 2004 under the Government Regulation No 10 of 2004. The Company is based in Jakarta and its head office is registered at Sampoerna Strategic Square, North Tower Lt 9-12 - Jl Jendral Sudirman Kav 45-46 Jakarta 12930. At present, PT Perusahaan Pengelola Aset (Persero) conducted business operations in all parts of Indonesia under the management of 4 subsidiaries and associates; PT PPA Finance, PT PPA Kapital, PT Nindya Karya (Persero) and PT Nindya Beton. In terms of financial performance, PT Perusahaan Pengelola Aset (Persero) succeeded in achieving acceptable and sound growth in 2015. According to PT Perusahaan Pengelola Aset (Persero) Annual Report 2015 as cited by JobsCDC.com, the Company posted an increase of 84% in total revenues from Rp2.15 trillion in 2014 to Rp3.97 trillion in 2015. Total net profit amounted to Rp170.96 billion in 2015, which represented an increase of 46% over total net profi recorded in 2014 of Rp116.89 billion. Background in Bachelor Degree (S1) in Accounting, Management, Finance. Have special expertise in the field of due diligence, financial modeling, research and consulting. JobsCDC.com now available on android device. Download now on Google Play here. Please be aware of recruitment fraud. The entire stage of this selection process is free of charge. 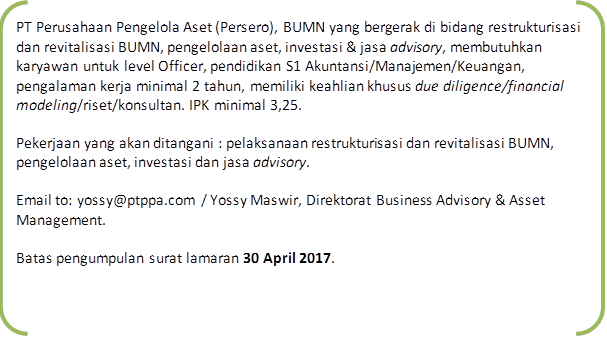 PT Perusahaan Pengelola Aset (Persero) - Recruitment Officer PPA May 2017 will never ask for fees or upfront payments for any purposes during the recruitment process such as transportation and accommodation.